BOSTON—The 11 members of the Electoral College from Massachusetts cast their ballots Monday for Democrat Hillary Clinton, with several noting that she received more popular votes for president even while losing the electoral vote to Republican Donald Trump. The electors, chosen by the Democratic State Committee, gathered in the House of Representatives chamber at the Statehouse to perform their constitutional duties in a ceremony steeped in tradition. Clinton won 60 percent of the vote in the Nov. 8 general election in Massachusetts and led the popular vote by more than 2.6 million votes over Trump, who on Monday surpassed the 270 electoral votes needed to become president. Democratic Secretary of State William Galvin noted that Massachusetts has voted contrary to the national Electoral College results many times, including in 1972 when it was the only state that backed George McGovern over President Richard Nixon. 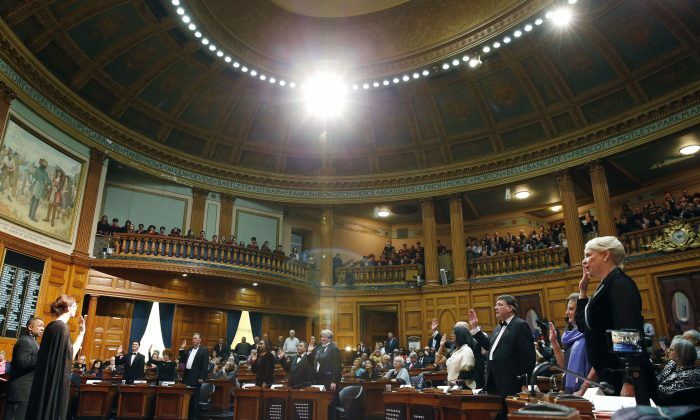 “Forty-four years ago at these very same proceedings, Massachusetts stood alone as the only state not voting for the constitutional winner of that election. Less than two years later he was no longer president,” said Galvin, referencing Nixon’s resignation amid the Watergate scandal. In formally nominating Clinton, Democratic elector Marc Pacheco, a state senator from Taunton, called the former first lady, U.S. senator and secretary of state the most qualified person ever to run for the presidency. He noted Clinton has strong Massachusetts ties as a graduate of Wellesley College. “Massachusetts also voted to reject fear. We voted to reject hate. And we voted against divisive rhetoric that has put the entire world on watch,” Pacheco said. The electors voted by slipping their ballots into a simple wooden box. A few hundred protesters opposed to Trump’s election rallied outside the Statehouse earlier in the day, with some calling for abolition of the Electoral College or changes in the system that would guarantee the national popular vote winner becomes president. “I think we all need to be present and speak out for the fact that we disagree with (Trump), rightly, and we disagree with the vote,” said Linda Nathanson, a retired college adviser from Brookline. Similar protests were held in state capitals around the U.S. In interviews prior to the Electoral College vote, several Massachusetts electors acknowledged receiving phone calls or emails from people suggesting that they consider forming an alliance with Republican electors wary of Trump to choose a “compromise” GOP candidate. But none of the electors said they gave serious thought to such a tactic, and all said they were proud to cast their vote for Clinton. The last Republican to win Massachusetts’ electoral votes was Ronald Reagan in 1980 and again in 1984.